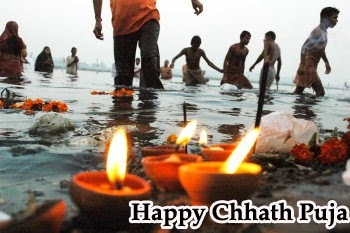 Chhath puja is celebrated with a great enthusiasm in Bihar, Uttar Pradesh and other states of India. It is done for four days continuously. Sunset is the worship of this puja. People celebrate it with different customs. Chhath puja is done after Diwali days and it has a good significance all over India. It is belief that if the puja is done during the ancient time with unvarying conviction that sun achieves desires if the custom of ‘arghya’ is offered with whole dedication. Moreover, the Bhojpuri and maithali speaking people do this puja. It intricately celebrated in Uttar Pradesh,Bihar, Jharkhand, Orissa, Assam, and west Bengal. The festival is dedicated to god of energy known as surya.The aim to celebrate this festival is to say thank you to god sun with fervor and pray for wealth, success and care of family and friends. On this day people wake up early in the morning and get ready. They keep fast for whole day and even leave without water by standing themselves in the water. Moreover, they offer Prasad and aragh to growing sun.According to Hindu calendar the chhath puja is celebrated at 6th day of month of kartika (October or November). Furthermore, the first day of puja is known as ‘nahai khai’, second ‘kharna’, third ‘sandhya arghya’, fourth ‘bihaniya arghya’. Each day is has its own importance. First day is of eat and bath. Second day is of fast that ends after sunset with 36 hour of long fast. Third day is of evening offering and fourth day is of morning offerings breaking of fast. This year the chhath puja will be celebrated from 15th November to 18th november, 2015. This festival is also celebrated in the month of Chaitra, which is March or April. Celebrate the festival with happiness and cheerfulness! Happy Diwali.